Migrants faced tear gas once again as they tried to cross the US-Mexico border from Tijuana to San Diego on New Year's Eve. Around 100 Central American caravan migrants failed in their attempt to cross the border and enter the US on Monday. As night fell and people on both sides of the border prepared to celebrate New Year's Eve, the migrants tried to cross over. 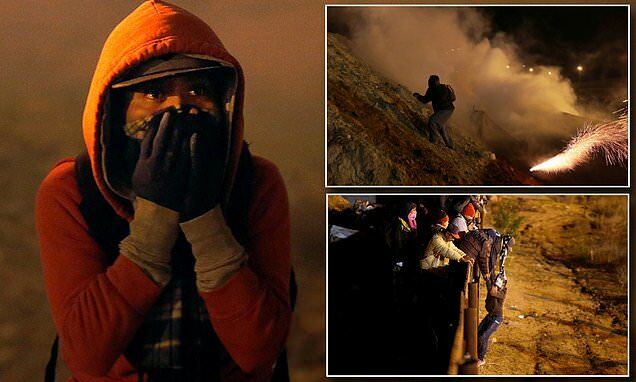 The US Customs and Border Protection (CPB) then hurled two smoke bombs at the migrants, holding them back. One migrant could be seen with his face covered in treatment after tear gas was thrown at the Mexican side of the fence in Tijuana. Other photos showed migrants trying to take cover as a thick wall of tear gas surrounded them, or crying out in pain after they were hit by the gas. The incident comes a month after the Trump administration was heavily criticized for tear-gassing mothers and children at the border. US Border Patrol shot tear gas and rubber bullets at a group of migrants, including toddlers, as members of the caravan tried to storm the border in November. Children were screaming and coughing in the mayhem at the San Ysidro Port of Entry when American agents tried to push the surging Central Americans back. Donald Trump later defended the use of tear gas on the crowd, claiming that border agents were 'being rushed by some very tough people'. Trump also claimed the gas was 'very safe' and only a 'very minor form' of tear gas. The president has yet to comment on Monday night's tear-gassing, although his rant against the Democrats for refusing to fund his wall has only continued amid the ongoing government shutdown.